In June the Renewable Energy Agency (IRENA) published a working paper explaining how leveraging on innovation can accelerate the energy transition. According to the study, the shift is already taking place but it is not fast enough to turn the global energy system from fossil-based to zero-carbon by 2050. 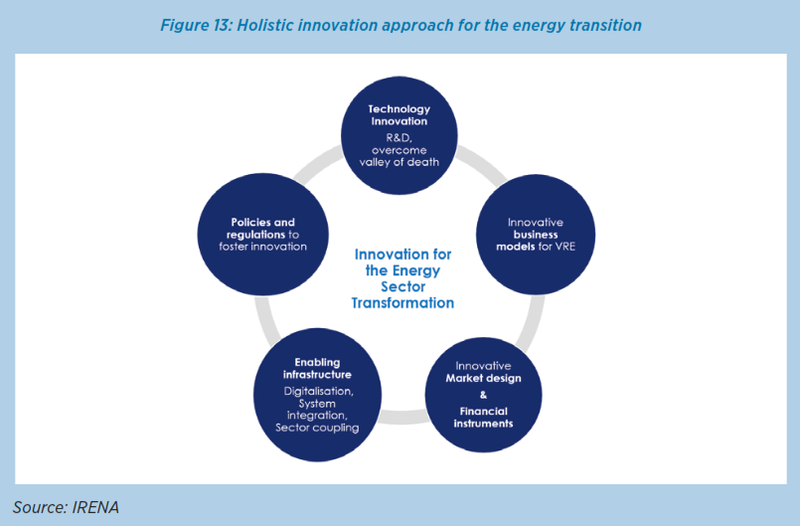 To enable the decarbonization of the energy system by 2050, technology improvements are not sufficient: innovation on policy, regulation, energy markets and business models plays a central role to meet and sustain the Paris Agreement Goals. In this prospective, government’s contribution is key. Indeed, public entities are able to create the right conditions to nurture innovation and, despite the huge investments needed, to help a transition that is economically feasible. In fact, the positive externalities generated will be able to overcome the costs: the reduced bad consequences will be between 2 and 6 times greater than the incremental costs of decarbonization. To keep the world’s temperature growth below 2°C by 2030, energy efficiency, electrification and renewable energy technologies are decisive. 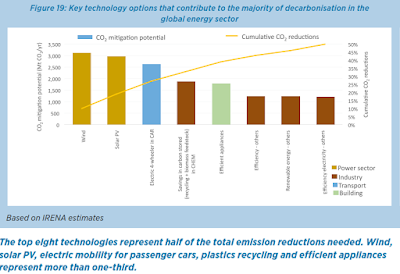 In the best case scenario, the energy-related C02 emissions would fall to 25,5 Gt in 2030 thus achieving the 2°C goal. 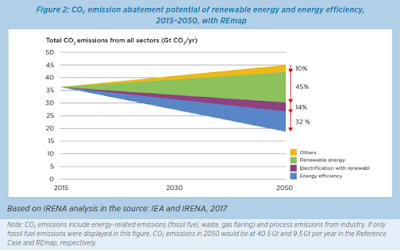 The further step will be reaching a level of 10 Gt CO2 emissions by 2050; in this case half of the reduction would come from renewable energy technologies. There is no doubt that innovation is the driver of all this: it does allow to make the renewable energies costs competitive when compared to fossil fuels, whose prices are distorted by subsidies and do not reflect drawbacks on health and global climate. 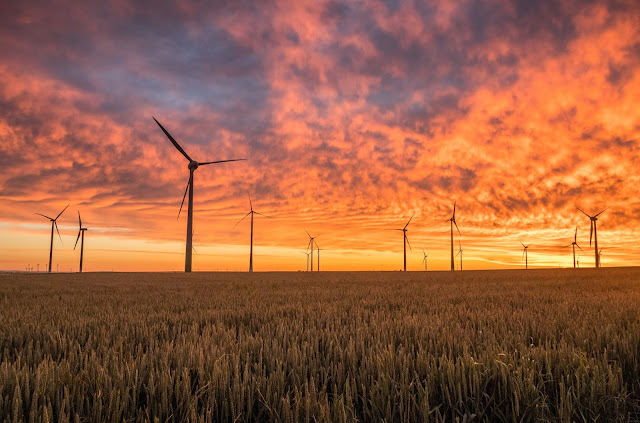 Therefore, renewable energies represent a “win-win-win” solution: not only they are able to fight climate change but also they promote wealth and social inclusion. However, to make them a real and successful solution, the governments’ intervention is fundamental: long term-policies to facilitate and stimulate the adoption of clean energies are key to reach the critical mass needed. 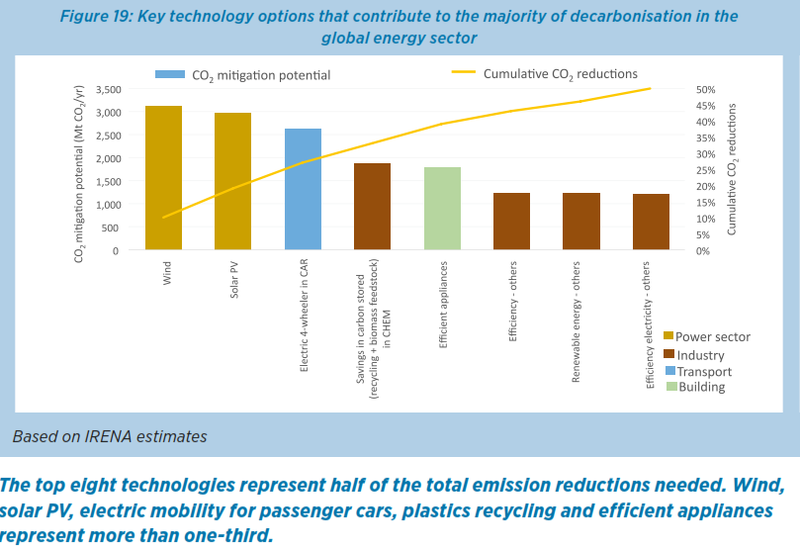 Focusing on technology, among the 110 low-carbon options available, four of them (wind power, solar PV, electric vehicles for passenger transport and saving the carbon stored during plastics production in the chemical industry) represent 1/3 of the potential abatement by 2050. However, each sector has different abatement costs and innovation requirements. While in the power sector the transition is already cost-effective and in transport it is about to, the industrial and buildings sectors are much more challenging. Furthermore, the study shows that freight transportation and aviation innovations are slower due to the lack of policy incentives and long-term perspectives. Once more, this aspect shows the crucial role of governments in stimulating innovation where it’s most required. 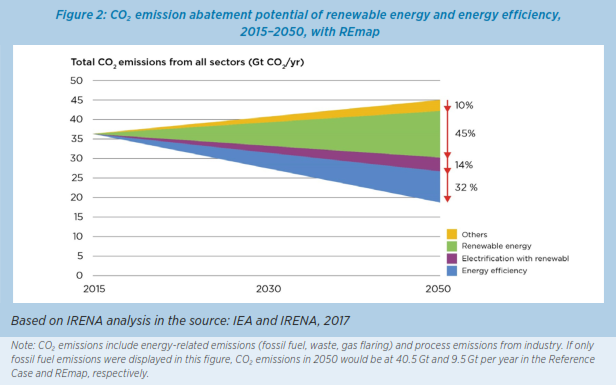 Finally, as highlighted by the working paper, if the energy system decarbonization goal is to be reached by 2050, we need further investments and financial resources. But then it’s always essential to look at all enabling conditions, with policies, markets, business models and regulations included. It should be firmly clear that to focus only on the technological part will never be enough.